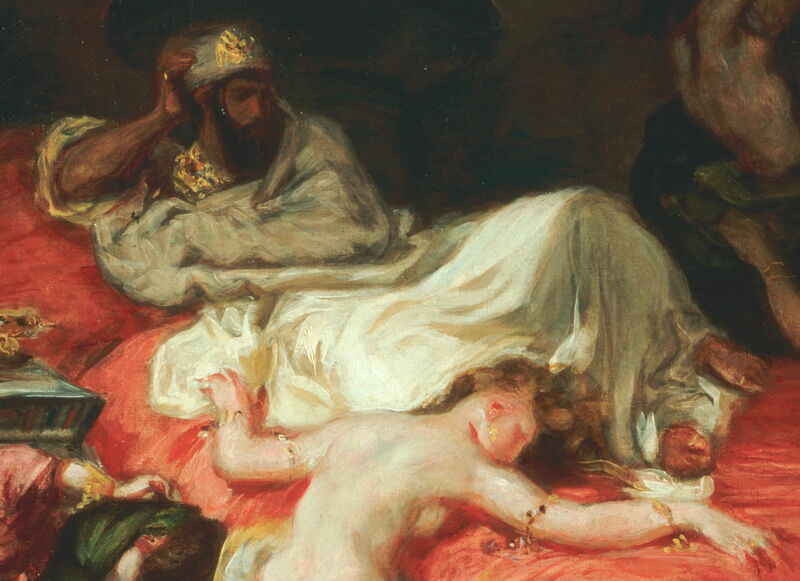 Eugène Delacroix (1798–1863), The Death of Sardanapalus (small copy, detail) (1844), oil on canvas, 73.71 × 82.47 cm, Philadelphia Museum of Art, Philadelphia, PA. Wikimedia Commons. I have perhaps been unfairly accusing painters of the nineteenth century of having abandoned narrative works. To redress the balance, this article looks at a couple of narrative paintings by one of the last great history painters, Eugène Delacroix (1798–1863), and concludes by asking whether Gustave Courbet (1819-1877) also painted narrative works. Delacroix painted two versions of this famous work: a huge original in 1827, which now hangs in the Louvre, and a smaller more painterly replica in 1844, which is in the Philadelphia Museum of Art. Its narrative is drawn from the play, written in blank verse by Lord Byron, and published in 1821. That in turn relies on an account in the historical library of Diodorus Siculus, a Greek historian, and Mitford’s History of Greece. Sardanapalus was the last of the great Assyrian monarchs, ruling a large empire from his palaces in Nineveh. However, a rebellion grew against him, and the story reaches its climax in the fifth and final act of Byron’s play. At the time, the river Euphrates was in high flood, which had torn down part of the protective walls of the city of Nineveh. Once the river started to fall again, this left no defences against the rebels. The leader of the rebels, Arbaces, offers to spare Sardanapalus his life if he will surrender, but he refuses, asking for a cease-fire of an hour. During that period he has a funeral pyre built under his throne. He releases his last faithful officer to flee for his life, and climbs the pyre. As he does so, his favourite wife, Myrrha, throws a lighted torch into the pyre, and climbs up after him, where they both burn to death. 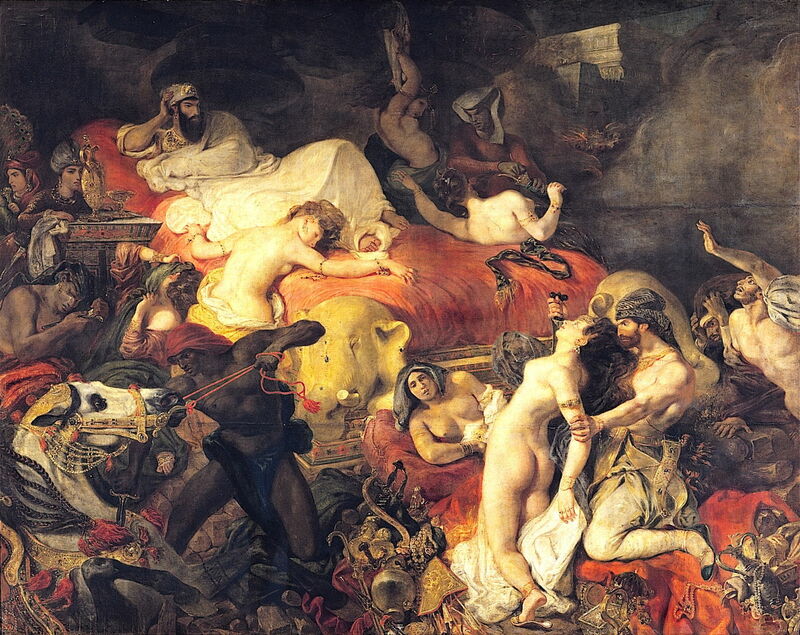 Delacroix departs considerably from that narrative to invite us to see Sardanapalus in a different light. In this, the original, version, his brushwork is tight and the huge canvas intricately detailed. Eugène Delacroix (1798–1863), The Death of Sardanapalus (small copy) (1844), oil on canvas, 73.71 × 82.47 cm, Philadelphia Museum of Art, Philadelphia, PA. Wikimedia Commons. When he painted the smaller replica seventeen years later, it was not intended to please the Salon, and he was far more painterly in its facture; I will use this version for detail views, as they are clearer and show his brushstrokes. 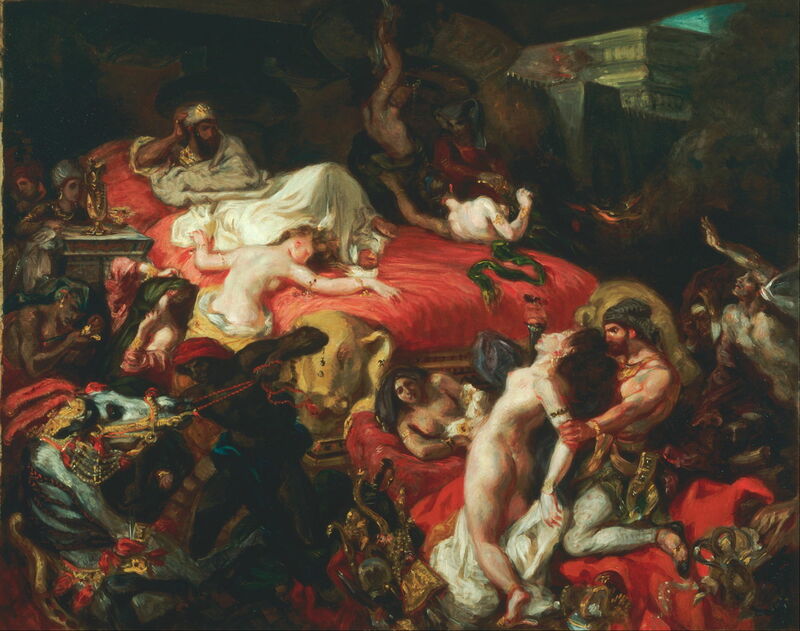 Instead of showing Sardanapalus and Myrrha mounting the funeral pyre, Delacroix places the king on a huge divan, surrounded by the utter chaos and panic as his guards massacre wives and courtesans. The strongest link to the original narrative is a gap opened up in the wall of the palace, which shows the rebels outside, and sets the scene in the ancient city of Nineveh. 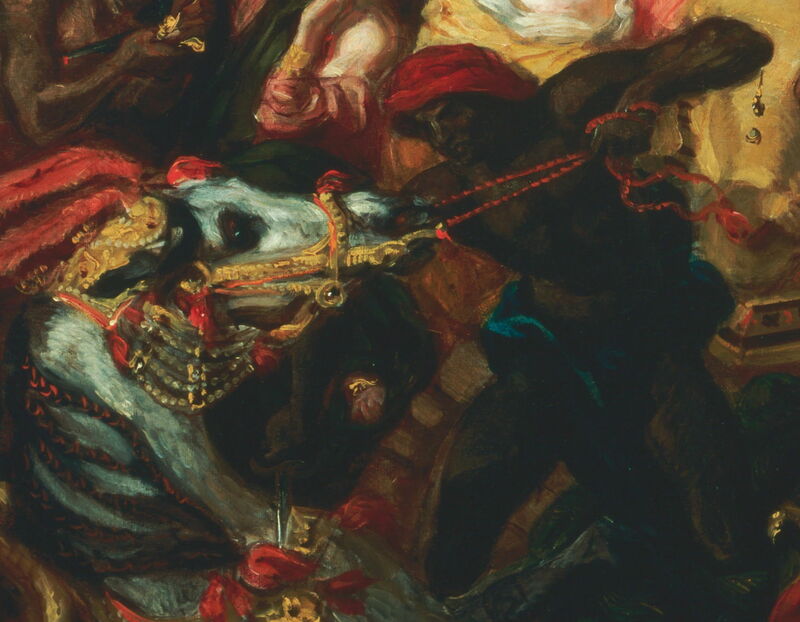 In the left foreground, a slave is struggling to bring Sardanapalus’ horse, with gold and jewels in its bridle and saddle, presumably so that it too will be killed. But most prominent in the foreground is the horrific sight of one of his courtesans about to have her throat slit by a guard. Her face looks up to the heavens, her back is arched, forcing her body and legs into an arc, as she is tensed ready for slaughter. With these scenes of carnage and destruction all around him, Sardanapalus rests, recumbent on his great divan. His face is mask-like, unmoved, and he stares coldly into the distance, his head propped by his right hand. Delacroix followed the traditional approach of using facial expression and body language to great effect. Several pastel studies which he made in preparation for the original painting have survived, and show the care that he took to get these right, to support his narrative. 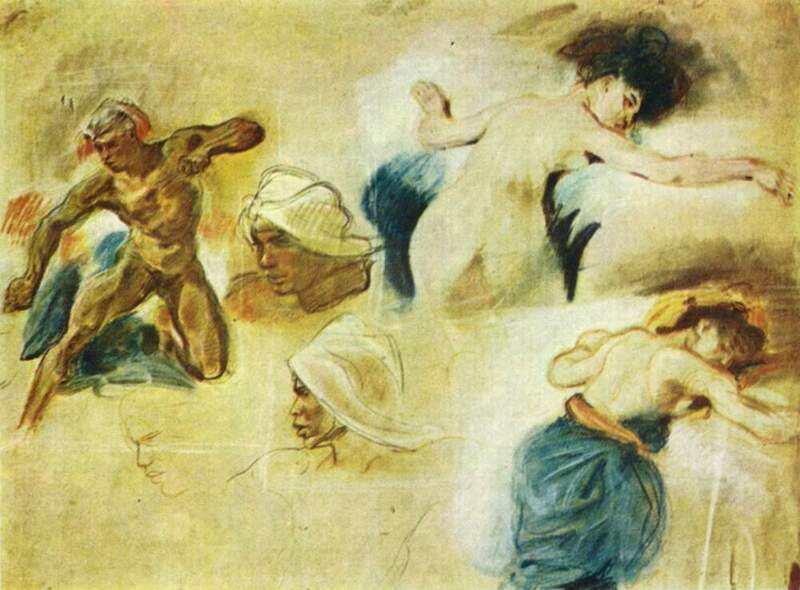 Eugène Delacroix (1798–1863), Study for The Death of Sardanapalus (c 1827), pastel on paper, 43 × 58 cm, Musée du Louvre, Paris. Wikimedia Commons. Here he has been working on the courtesan who has flung herself on the divan, at the feet of Sardanapalus, and the slave struggling with the horse. 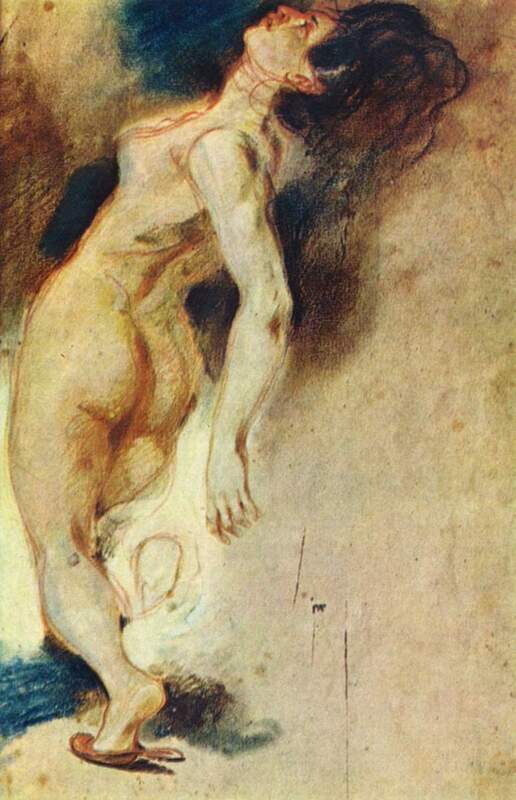 Eugène Delacroix (1798–1863), Study for The Death of Sardanapalus (c 1827), pastel on paper, 41 × 28 cm, Musée du Louvre, Paris. Wikimedia Commons. This is a study for the courtesan in the foreground, who is just about to have her throat cut. Delacroix has extended his tools for telling this story to include colour (a quality for which he is well-known, of course). His extensive use of rich, warm colours heightens the conflict between the king’s cold detachment and the surrounding carnage. For not only is the red warm, but it is the colour of the blood which is just about to be spilled. Without showing us so much as a drop of blood, the painting is already filled with it, washing away the remains of the fallen dynasty. Delacroix continued to paint narrative works after 1850, until shortly before his death in 1863. One of the last is this very different painting, referring to one of the many stories embedded within Ariosto’s epic poem Orlando Furioso, first published in 1516. This poem shares characters and narrative elements with other epics, including Tasso’s Jerusalem Delivered, and Delacroix painted several different scenes from it. One of its leading characters is the beautiful but pagan princess Angelica, who is frequently the target of the leading males’ amorous intentions. Eventually she falls in love with a very ordinary Moorish soldier, Medoro, and runs away with him to Cathay, leaving lovesick knights behind. At one stage Medoro is badly wounded, and Angelica expresses her love by rescuing and caring for him, nursing him back to health. It is this latter story which Delacroix tells us here. Medoro is shown, his right arm in a sling, still in armour, riding his horse back. Angelica stays alongside, holding his left hand. 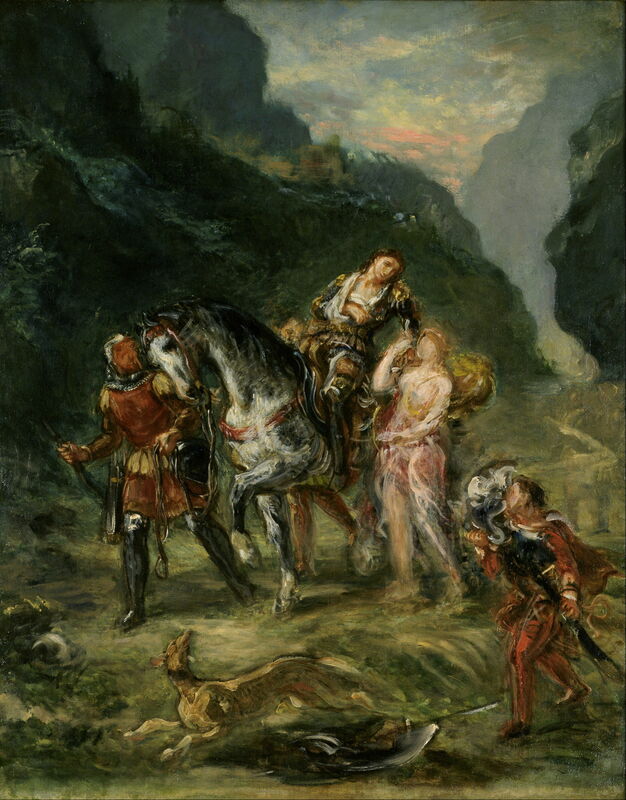 His attendants, accompanied by a dog (foreground), lead the horse through a narrow mountain pass, heading for safety, and Medoro’s eventual recovery. 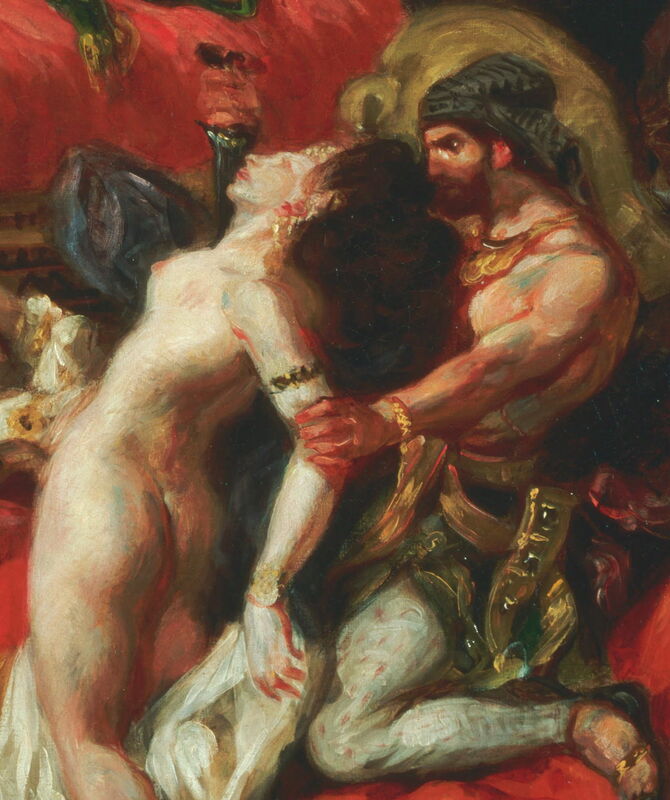 What I find strange here – particularly given his long experience, and the examples of The Death of Sardanapalus and previous history paintings, is the way in which Delacroix deliberately shuns the traditional techniques using facial expression and body language. 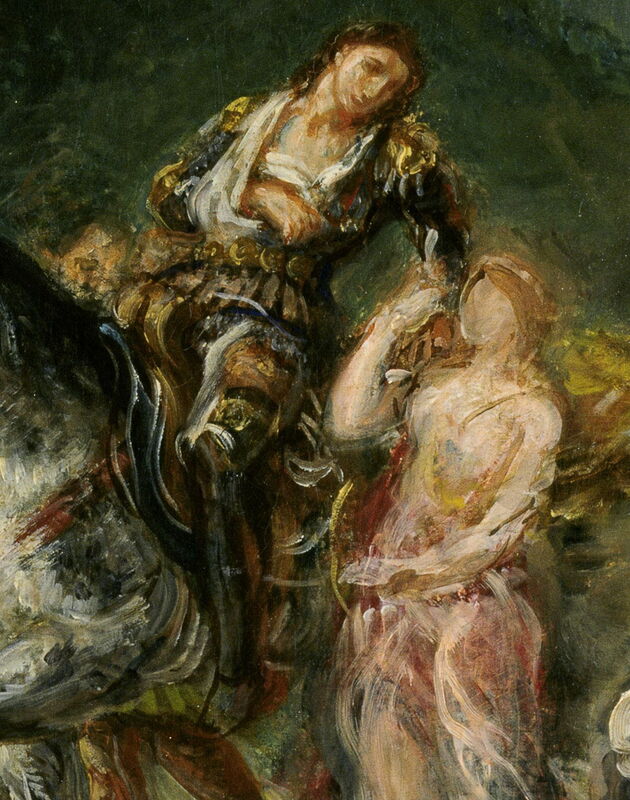 Eugène Delacroix (1798–1863), Angelica and the Wounded Medoro (detail) (c 1860), oil on canvas, 81 × 65.1 cm, Art Gallery of New South Wales, Sydney. Wikimedia Commons. Of the four faces seen in the painting, only Medoro’s shows any features at all, and it appears strangely expressionless. Angelica’s face is a formless blur of flesh colour. There is slightly more content provided by body language, but apart from her right arm, Angelica’s form gives us almost no cues at all. 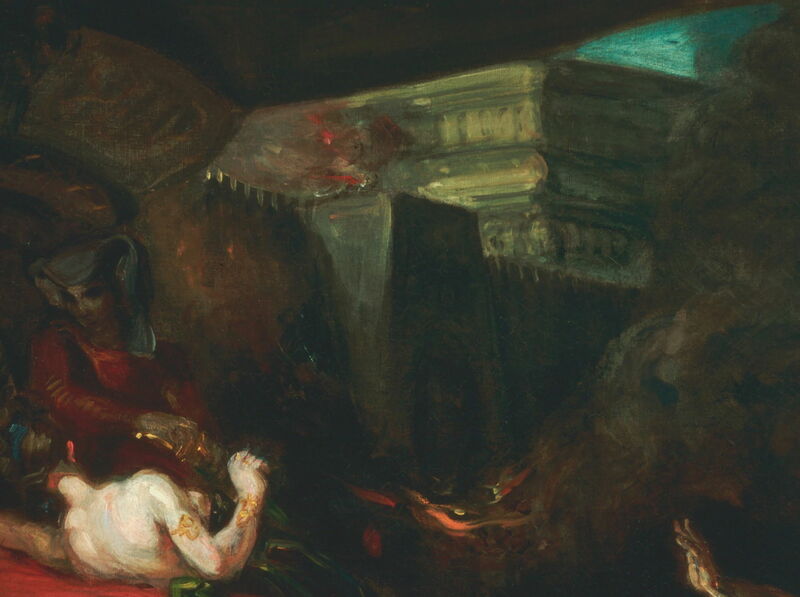 It is almost as if Delacroix is abandoning the formal techniques of history painting, during those final years, accepting that the genre is now moribund. Courbet was of the next generation, and the final bridge to the brave new world of Manet and then the Impressionists. This begs the question as to whether Courbet painted narrative works, which in turn questions how we read his paintings. The viewer can of course construct narrative around many paintings whose intent was quite different. Courbet’s huge A Burial at Ornans (1849-50) is one such work, where we can be fairly confident that he intended to show us a straight realist and realistic image of his grand uncle’s funeral. The work which is generally considered to be the most likely to contain narrative is his The Painter’s Studio (1855) – or, to give the full title, The Painter’s Studio: a Real Allegory of a Seven Year Phase in my Artistic (and Moral) Life. 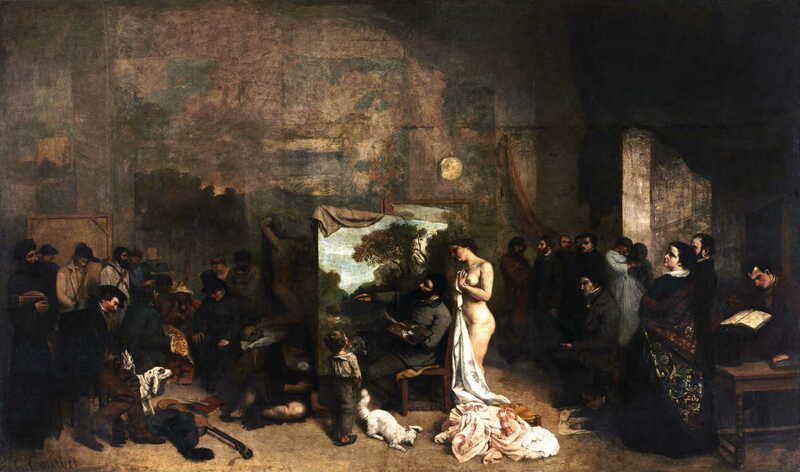 Gustave Courbet (1819-1877), The Painter’s Studio: a Real Allegory of a Seven Year Phase in my Artistic (and Moral) Life (1855), oil on canvas, 361 x 598 cm, Musée d’Orsay, Paris. Wikimedia Commons. As one of the great ‘problem paintings’, it has attracted considerable attention, and many explanations including various forms of allegory. In his recent book, Professor Jim Herbert challenges the conceptual coalescence of the painting and proposed analyses, and surely ends such speculation. So I think that the best answer is that Courbet did not paint narrative works, however much we might try to read narrative into them. The huge contrast between Courbet’s paintings and the narrative works which I have shown in this and other articles should be evident. Herbert, JD (2015) Brushstroke and Emergence: Courbet, Impressionism, Picasso, University of Chicago Press. ISBN 978 0 226 27201 6. Reviewed here. Noon P & Riopelle C (2015) Delacroix and the Rise of Modern Art, Yale UP for The National Gallery and Minneapolis Institute of Art. ISBN 978 1 857 095 75 3. Reviewed here. Posted in General, Painting and tagged Ariosto, Byron, Courbet, Delacroix, narrative, Orlando Furioso, painting, Sardanapalus. Bookmark the permalink.